Generations of Iranians have grown up with the story of Kaveh Ahangar. Kaveh saved many people by starting a rebellion against the tyrant Zahak Mardush. Zahak had been terrorizing Iranians for years, feeding the brains of their children to the snakes who had grown on his shoulders. Many Iranians are acquainted with the story of how Kaveh Ahangar helped Fereydun to raise an army of dissatisfied Iranians, searching for freedom. Fereydun fought against Zahak, using a bull-headed mace. However, few Iranians know that examples of bull-headed maces were made until the end of the Qajar period, and even less-known is that bull-headed maces are still used in the initiation ceremonies of young Zoroastrian mobedan. Iranian legends, such as the story about how Arash Kamangir lost his life, are part of a rich arms heritage. Arash was in a quest to determine the frontier of Iran, as agreed with the Turanians, where he strung his magnificent bow, and put all his strength into the draw, and let the arrow fly. Legend has it that he put all his energy and power in the arrow, which flew for one thousand farsang, but as a result, it led to his immediate death. How many children had tears in their eyes when they listened to this emotional story, when their parents read it to them? How many Iranians felt proud and full of joy when they listened to this tragic story? Iranian bows were of composite nature and making these marvelous weapons was an art in itself. The Kaman Morrakab (composite bow) consisted of three component parts: a wooden core, horn, and sinew. The surface of the bow was lacquered. Some of them show beautiful hunting scenes and inscriptions. Making composite bows was a tedious and skilled craft, involving months of labor. Many Iranians know that large numbers of the ancient peoples were Zoroastrians, and they've read the stories of Achaemenian, Parthian, and Sassanian kings. However, few Iranians know that the holy book of the Avesta contains many terms on arms and armor, testifying the deep-rooted warrior tradition of Iranians. The stone reliefs of the stairs of Apadana show Medians and Persians armed with their short swords or akenakes. In his edict in cuneiform script, Darius proudly proclaims that he is proficient in handling the spear and bow. The proclamation appears in his edict (Bande 9) at Nagshe Rostam where Darius I stated "I am skilled with my both hands and feet". " I am a good rider, I am a good archer on foot and on horseback, I am a good spearman on foot and on horseback" (see Sharp, 1964/1343:85). As Iranians, we are raised with the stories of the Shahname, where Rostam fights for the integrity of Iran and defends the Iranian kings against their enemies. Many scholarly works have been written about the character of Rostam, his father Zal, and their special relationship with the legendary bird Simorg. Some scholars consider Rostam and Zal as part of the Iranian dynasties and others consider them to be characters who are alien to the nature of Iranian dynasties. We grow up listening to the stories of how Rostam, Giv, Sohrab, and other Iranian Pahlavanan fought on the battlefields. We hear about how they used their kaman (bow) to shoot their tir (arrow). The accounts tell how they used their neyze (spear), and how the spears were broken. In battle, the heroes also used their gorz (mace) and shamshir (sword). We read about their struggles such as wrestling on the battlefield until one foe is killed by another's khanjar (dagger). Who does not feel sorrow when he/ she reads the tragedy of Sohrab being killed by Rostam? All Iranians know that Rostam killed Sohrab by stabbing a khanjar (dagger) in Sohrab's right side, below his ribs. Many Iranians have seen miniatures of Shahname, which depict this type of dagger. Few of them however, have seen the shape of a khanjar. Generations have grown up with the tragic story and heroic fight of Shah Ismail Safavid, who challenged the mighty Ottoman army on the Chaldaran battlefield. Many Iranians admire the heroic deeds of Shah Ismail Safavid who joined the first rank of his cavalry to attack the Ottoman Janissaries (infantry elite units) and the Ottoman artillery soldiers. There are many historical records of how Shah Ismail Safavid used his shamshir on the battlefield, and the accuracy of his blade. Seldom mentioned is that the Safavids used shamshirs with watered blades tigh-e johardar, which enjoyed the best reputation in the region. Ottomans, Arabs, Indians, and later Europeans all admired the beauty and efficiency of Iranian blades. Watered blades were considered holy material during the Safavid period; touching blades with one’s bare hands was strictly forbidden. In the historical manual Futuwwat Name-ye Soltani by Kashefi Sabzewari, it is clearly stated that one should perform ablution before touching a blade. From today's point of view, the rules make sense as the acidic nature of sweat and oil of human hands would cause the surface pattern of watered blades to corrode. In many Iranian history books, the founder of the Afsharid dynasty, Nader Shah Afshar, was especially fond of tabarzin (saddle axe) and tabar (axe). A statue of Nader Shah Afshar wielding a tabarzin (saddle axe) can be seen in his mausoleum. There are numerous accounts of Nader Shah, and of how he used his axe on the battlefield. Few Iranians know about the beautiful intricacies of this type of weapon, and know that some of the chiseled surfaces of some axes are true masterpieces of art. Sophisticated methods of decoration, such as zarneshan (raised gold-inlaying), tahneshan (flat gold-inlaying), and zarkhanest (gold-overlaying) were used to inscribe the names of the makers' of the swords. Further decoration methods, such as minakari (enamelling) and morasa (insetting with jewels) were also used. Iran has a very rich tradition of making quality arms and armor. Many of these pieces are true masterpieces of art and handicraft. It is time for Iranians to renew their appreciation of these beautiful pieces as their ancestors did. Iranian arms and armor are not only masterpieces of art, but they are the true legacy of an Iranian martial culture and heritage. The artifacts represent the spirit of Rostam, who has kept our country alive throughout centuries of tumult and upheavals. The weapons are works of art frozen in steel, representing the Iranian warrior codex and the spirit of jawanmardi. The cultural history tied to these artifacts needs to be reclaimed and elevated to high status again by my dear compatriots. Note on the Author: "Manouchehr Moshtagh Khorasani has a MA degree in English and Business Administration and a minor in Spanish. He competed in different martial art events internationally. He is an instructor in Iaido (ancient Japanese sword drawing) and also teaches different empty-handed martial arts. He has done extensive research in the field of arms and armor and is a moderator for the forum Edged Weapons from the Middle East, Asia and Africa of the American organization Swordforum International, where he answer all questions related to the arms and armor from those regions. 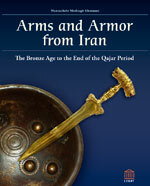 After eight years of extensive research, he has written a book on Iranian arms and armor entitled Arms and Armor from Iran: the Bronze Age to the End of the Qajar Period.Click to read more about the book Currently, he is residing in Germany.